Feedback is an essential component to personal and organisational growth and success. In part one – let me give you some feedback – we looked at how feedback helps answer the question “How am I experienced by others?” and is essential for improvement, self-awareness and for nurturing an environment of high encouragement and trust. INVITED feedback is always best. If you’re asking for feedback you are already in a better posture to receive it than if it was offered unsolicited. You’re somewhat in control of the timing, the circumstance and the framework of the feedback. Inviting feedback also serves the person giving the feedback. If they don’t have to find a way to raise a difficult topic with you or overcome any barriers to delivering encouragement they have emotional energy free to direct in to giving helpful feedback. When you’re intentionally seeking out feedback for growth, choose people who are FOR you and are onboard with the purpose of your work or with the direction of your character development. Choose people whose wisdom and honesty you can trust and rely on. And those who are willing to journey alongside you rather than just ‘dump and run’. In some situations it might be most beneficial to ask someone who is well-educated or experienced in the area you’re looking for feedback to inform their reflections. Other times, you might be looking for the observations of people who aren’t as involved or aware to get a more clear ‘outsider’ perspective. Choose appropriately. Leaders have opinions on everything! The nature of leadership is that they are actively engaged in making things better. They’re constantly reflecting on best practice and looking for the best way to lead others towards great outcomes and what is most likely to cause people and organisations to flourish. Be SPECIFIC about what you want reviewed. Particularly if you’re in the early stages of actively receiving feedback (or the person you’re asking is in the early stages of giving it) narrowing the focus of review can be beneficial and provides a softer entry. Specific questions or a more narrow field of focus eliminates the distraction of the irrelevant. What am I afraid to ask and why am I afraid to ask it? Previous experiences of failure, doubts about our own abilities, and just our general desire to succeed and be approved of shape our attitude towards feedback. Often, it makes us fearful of any kind of review because we don’t want our negative internal dialogue to be given an ‘outside’ voice. Identify that with the person who is reviewing with you. In doing this you empower them to be gentle with you and to stand with you against your fears and insecurities, and in bringing those into the light they can be somewhat diffused. If you’re looking to shape a healthier culture of feedback in your relationships, families, teams or organisations you need to model what it is that you are wanting others to value. The temptation to go first in GIVING feedback must give way to modelling the RECEIVING of feedback. For more in the feedback series – read “let me give you some feedback“. Stay tuned for posts about GIVING feedback and RECEIVING feedback. do all things really work together for good? I have this verse (Romans 8:28) on my wall. 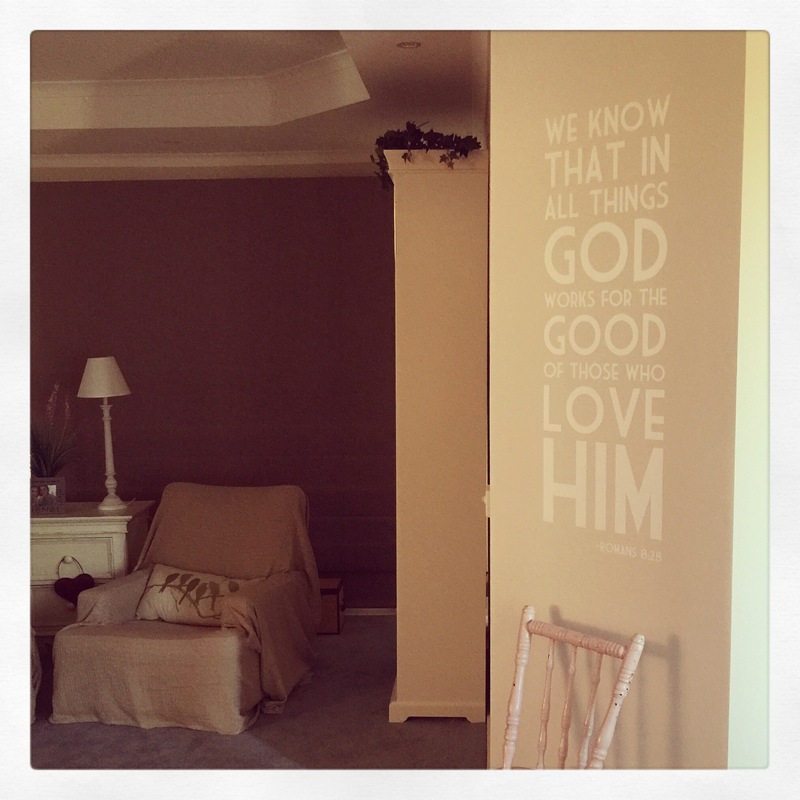 Because I walk by the wall so frequently, I am constantly reminded of this promise and affirmed and strengthened by it. As with all scripture, this verse has the potential to be misinterpreted or misapplied which can lead to disappointment and disillusionment. Here’s three truths that are essential for understanding this text correctly. 1. All things work out for good – even if they aren’t good now. This is a future promise not a present guarantee. Paul does not say “all things ARE good for those who love the Lord”, he says, “God WORKS all things for good”. There’s a big difference. Our faith and trust in God allow us to interpret our current trials and pains through the lens of a future hope we have that these hurts will not be for nothing – that they will be caught up in God’s big picture plans for our lives and His glory. To look at some of my own life experiences – death of family members, family breakdown, miscarriage or a painful divorce are NEVER good in and of themselves. This verse doesn’t suggest that for those who love God divorce is good or for those who love God death and loss are good; not for a minute. It does promise us that in the hands of a loving Father those experiences can be redeemed and we can learn, grow, mature and flourish through them, because of them and inspite of them. 2. All things work out for good – but sometimes even that good doesn’t feel good. Because we are not God and because of the many shortfalls in our character and ability to know the future, what we think is good for us and what God knows is good for us are not always the same. 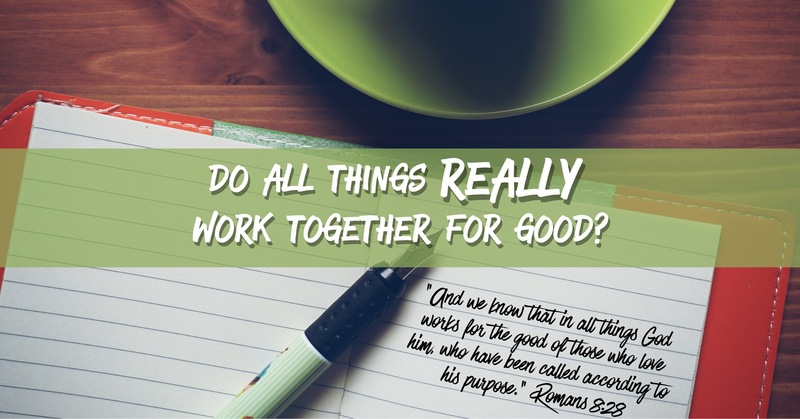 God’s plans to redeem all things for good may include the good of doing without things that He knows aren’t healthy or helpful for us – even if we want them. They may include us being humbled or learning painful lessons that ultimately grow and refine us. To fully appreciate the “good” God is bringing about we need to ask Him for HIS eyes to see and appreciate what He has in mind for us. It may not look good to us, but He is a perfect Father who only gives good gifts. He invites us to trust His big picture plan. 3. All things work out for good – but the timing of the good is not ours to know or control. My maternal Grandparents were killed in a car accident together when I was 11 years old (and they were only in their early 60’s). Our family treasured the promise of this verse as we absorbed the news of their tragic death and prepared for the funeral and life without them. We learnt it as a song! At the funeral, a family member came to faith! The witness of Grandma and Pa’s lives and the confrontation of their death brought this lady into an eternal relationship with God. See, we said, God is even using this for good!! I love that story. I love the grace of God to make this promise so tangible for us. It stood me in good stead for future trauma and tragedy that was ahead for us as a family and me personally. But the more common story is that it can often take more than a few days for the “good” to evidence itself. Sometimes it may be years in the making. Sometimes it may even remain unknown to us. Just because we haven’t seen the good yet doesn’t mean it’s not coming. God’s timing is always perfect. How have you seen this promise at play in your life? When do you find it hardest to hold on to? When has it been most encouraging?